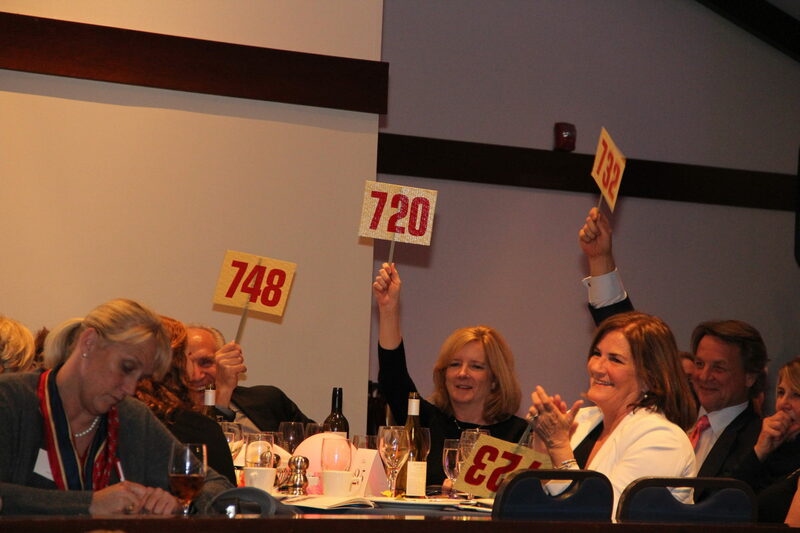 For our potential auction Patrons and Sponsors, please see the attached letter. Graduated from: Boston College in 2017 with a Bachelor’s Degree in Environmental Geoscience. Grew up sailing: In an Opti at Lauderdale Yacht Club on the Atlantic. Favorite places to race: Fort Lauderdale, Florida; Rio de Janeiro, Brazil; Puerto Vallarta, Mexico; and Palma de Mallorca, Spain. MS: What DO Olympic athletes do after the Games? CP: It’s an interesting question to ask in the US for sure. Depending on the country you are from, you typically have a lot of resources to back you up and it’s easier to transition into other campaigns. Look at Peter Burling (NZL), Giles Scott (GBR) – guys who were medalists in their (Olympic) classes went onto the America’s Cup, the Volvo, etc., because they have federation backing. They’re easily able to transition into something else between Olympic events. 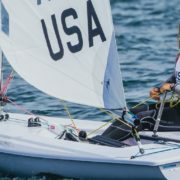 Sailing in the US, if you stop Olympic sailing, the funding doesn’t continue so there was this lull for me after the Olympics, I had to figure out how I was going to afford the next couple of months. MS: When does training start over for the 2020 Games? CP: Some people go all the way through and continue training. I trained for six years for the last Olympics, I was super burned out and didn’t have anything left to put back into it so took time off. Now is the time that people are slowly trickling back in so I’m hoping to get together with training partners soon. You want to be the best and be with the best, beating the best. MS: You recently moved from San Diego to San Francisco – what are you hoping to accomplish there? CP: I moved specifically to train. I was also fortunate to be a grantee of the St Francis Sailing Foundation which was always a constant throughout my campaign. Past Olympians sit on the Board and many great sailors are involved, people who can help with anything from legal to fund raising. They offer the entire package which is huge, especially when things get a little shaky, they make the difference when things get really tough. They also share the same goal as I do – bring medals home for the US, it’s an awesome thing. MS: It can’t be all work…what are you doing for fun on the Bay? CP: Well, I live on a boat at the Richmond Yacht Club – a Nauticat 33, a little motor sailor with a pilot house, not a fast sailboat but I’m okay with that! I’m on fast boats all the time. It’s great and the club is amazing, they help me out a lot, it’s a 5-minute walk to my boat and I can be sailing in the Berkeley Circle in 30 minutes. It’s hard to beat. Having done only Olympic sailing for the last 6 years, I’m finally trying to explore other avenues – anything I can get my hands on. I recently trimmed main on the Open 40 California Condor Buzz which was a blast. I’d love to explore foiling, giant Mod 70s, Volvos – any of that, as well as other aspects of sailing like match racing and team racing. MS: Did you always know this is what you wanted to do? CP: I started sailing Sabots in San Diego when I was very young. When I was about 5-6 years old, I found out that sailing was in the Olympic Games. I decided then I wanted to go to the Olympics. My whole life slowly got me closer and closer to that goal. Did I always think I was going to win? No, but to have the self-belief that you are is something entirely different. I just believed I could do it if I put in the time, energy and effort. 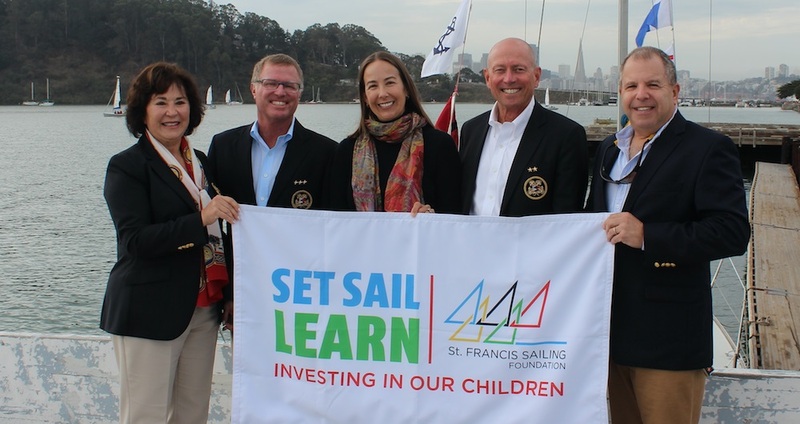 I was fortunate enough to meet people like Bill Kreysler (President, St Francis Sailing Foundation) who helped me out a lot in the beginning and Chris Frackiewicz from New York. Without these sponsors there’s no way I would have made it happen. It’s amazing for me to look back and know that those guys saw something in me that even I didn’t really know I had. MS: Was your Olympic campaign a college trade off? CP: In the US, the thought is that you can do both. When I was in high school, I decided that there was no way I could dedicate the time needed to do both school and sail to win a medal. You’re either going to do both half assed and not being truly successful at either, so I went full-time sailing. A testament to that is that I was the only one to win a medal in the 2016 Olympic Games. Looking forward, it’s a balance – do I pursue my career in professional sailing which is the only way in the US that you can continue in the sport, or do I retire at some point, go to school, get a job and go that route? The one thing I have learned about myself is that I like the independence that you learn through an Olympic campaign – it teaches you a lot of skills which have helped me see better ways of doing everything I am doing. MS: What are some of the challenges you’ve experienced on the Olympic trail? CP: Ensuring that your living expenses are covered and stuff like that is an important part of a campaign and it can take away from contributing to your final goal which is to win gold. Another challenge is learning how to prepare for the event, and the only way to do that is to go to a lot of events but all that travel and organization can take away from good solid time on the water. MS: What would you do differently to improve your training? CP: I’ve had a lot of time to reflect looking back at the campaign and how I would do things differently, how would I improve. The biggest jumps in my ability came about after long training camp blocks. I have become very good friends with the Canadian guys and we basically moved to Florida for four months during the winter. We sailed every single day and that is when I made a massive jump in my skills. I plan on doing fewer regattas this fall and doing many more days on the water. I think that’ll be better for me. MS: Are you overwhelmed at going into another Olympic campaign knowing what you do? CP: No, I am excited about it. The only thing I’m a little nervous about is the fund-raising but I’m in the process of making proposals. Nonetheless, there’s still that uncertainty factor, just not knowing how it will all come together. MS: What DOES it cost to do an Olympic campaign? CP: A ballpark figure would be $150K/year prior to the Olympics, then the Olympic year probably $200K, so roughly half a million dollars for a full campaign. I think I needed more money to do what I think I needed to win gold. 70% of the campaign is just boat handling and training, going sailing all the time and knowing what it takes, knowing how to set up in a start, knowing that routine, that’s a huge part. 20% of it is the logistical aspect, the last 10% is just boat speed, that’s focusing on squeezing every little bit of speed out of the boat – for sure there are gains to be made but that last 10% is the most expensive part too, LOL! It’s a funny balance. MS: What is important to you in your training? CP: Great coaching is huge and I think that’s one of the things that US Sailing is doing well now under Malcolm Paige’s guidance. 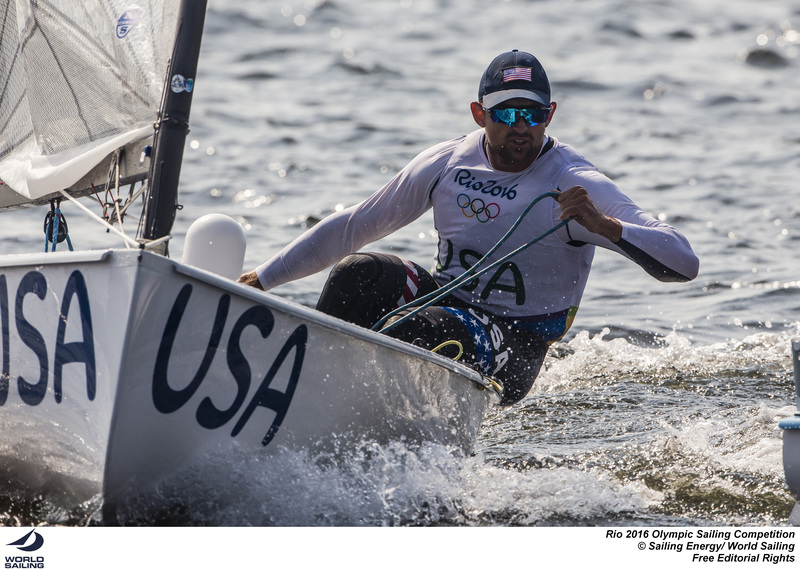 He’s got more people involved and is getting great coaches to try to put American sailing back on top. That’s the other thing too, there are plenty of great sailors out there who perhaps don’t have what it takes to get to the top but at the same time they make good coaches. When I’m coaching Finn sailing, on the other hand, there are some things that I keep to myself because that’s my own hard work – they don’t need to know ALL my secrets! Training partners are also important to me. They got me to where I am now. It’s a lot of blood sweat and tears, you push each other to total breaking point. Some of my fondest memories of the Olympics and leading up to the campaign is the time I spent with those guys. I’ll take special trips to Toronto every now and then just to see them because they are truly my best friends. MS: Just how hard do you need to work at getting to – and staying – at the top in this sport? CP: I see guys who work hard but you have to work even harder than you think to be at the very top – I think it’s something I didn’t fully realize until about 9 months before the Olympics. 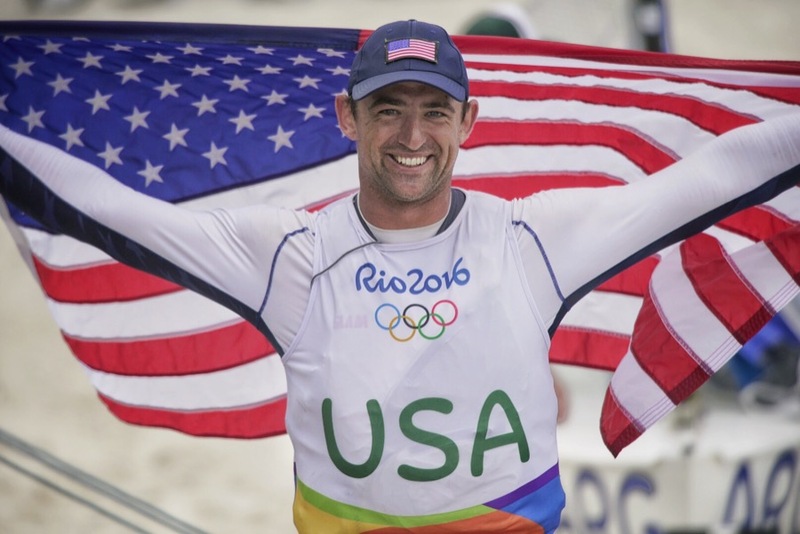 I had kind of a dramatic Olympic trials with Zach Raily the silver medalist from 2008 coming back to sailing, it came down to the last race…just knowing he was there definitely pushed me and got me to think of things in a different way which in the long run helped me tremendously. It has changed how I will approach anything for the rest of my life. The Olympics will do that and it’s pretty special to be part of that. MS: Who do you consider your mentors? CP: My parents Doug and Connie Paine, and my sponsors Bill and Chris. Chris was a Polish immigrant who came to America with $46 in his pocket and now he he’s very financially successful, a great role model. I happened to meet him at the boat park in Clearwater, FL, and he liked what I was doing. Then, we had the Finn Gold Cup here on the Bay in 2010. We were out in front of the St FYC and I was just wheeling my boat up. A gentleman comes up to me and starts looking at my boat. He introduces himself as Bill and said he used to sail a Finn. Turns out we are both from San Diego, Bill’s parents had a house in Point Loma and Bill was a member at the same yacht club I was sailing for, he went down to the junior program where I was working at the time and said,”I have met Caleb Paine and I want to buy him a boat”. Without meeting Bill I wouldn’t have had the new boat I needed – LOL! I was able to get funding from US Sailing and slowly moved my way up, then Chris bought the boat I sailed in the Olympics. Without those guys, there’s no way it would be possible. It’s one of the coolest things about sailing, you meet the best people, it’s awesome. I have friends all over the world and am very fortunate to have met the people I have – they have been a large contribution to what I have been able to achieve. 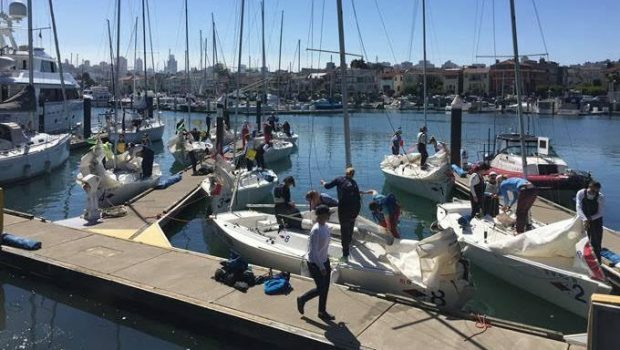 The first regionally focused Olympic Development Program (ODP) Training Camp gets underway on Saturday in San Francisco with 40 youth sailors, ages 15-20, from around the country. The notable coach lineup includes Rio medalist Caleb Paine (who recently re-located to San Francisco to begin training for the 2020 Olympics) along with Grant Spanhake, Kevin Hall, David Liebenberg, Dane Wilson, Mark Andrews and Pete Melvin. 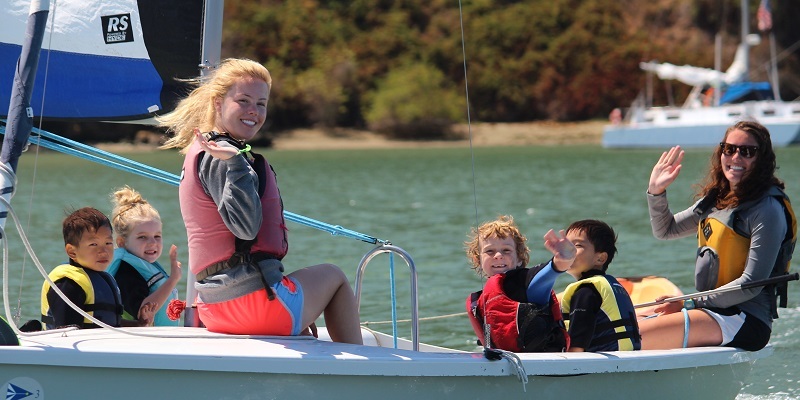 Sponsored primarily by the St. Francis Sailing Foundation, the 3-day camp will be held at the St. Francis Yacht Club, with additional support from the Belvedere Cove Foundation. The training camp is part of a high-performance fall training series for ODP team members and the US Youth Worlds team to prepare for the Youth Worlds in December. Significantly, however, this is the first time that US Sailing has extended participation in its training camps to local regional programs. The goal is to have ODP coaches and sailors work alongside the local sailors and coaches to encourage collaboration and knowledge sharing on both levels. Participants will be on the water from 10-2pm daily, followed by a debrief. The skill focus for this camp will be on sailing in heavy weather; the October and November camps will focus on speed and racing, respectively. The following classes will be supported: Laser Radial, i420, 29er, and Nacra15. Regional sailors attending the clinic were selected based on high skill level (top 15 finishers, or equivalent skill level, at the class Midwinters, North Americans, or other championship-level events) and heavy weather experience (experience and capability sailing in high breeze -20kts), as well as demonstrated commitment to the sport and a high fitness level. 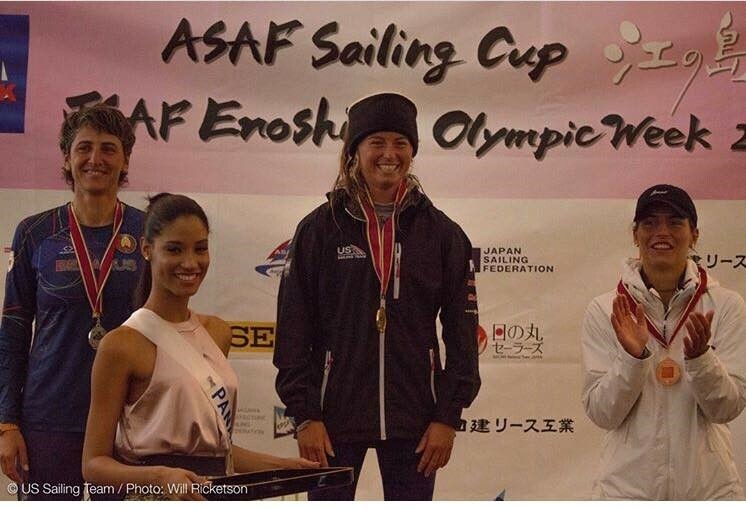 Daniela Moroz receives support from the St Francis Sailing Foundation. 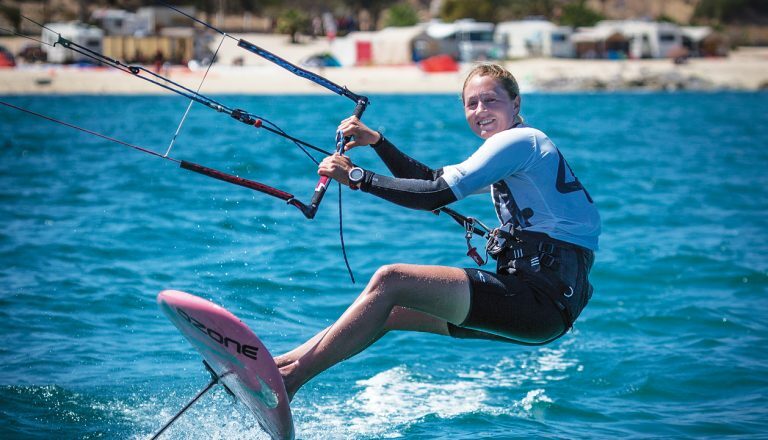 With the 2018 Youth Olympic Games in Buenos Aires, Argentina, on the horizon, 15-year old Daniela Moroz changed gears this past week, switching out foiling gear for a twin tip and inflatable kite to compete in her first twin tip racing event – IKA TT:R Kitesurf European Championships, held in Gizzeria in southern Italy. The Formula Kite World Champion and Rolex Yachtswoman of the Year had just a couple of sessions on a twin tip and inflatable kite on her home turf, San Francisco Bay, before heading to Italy, so she was stoked with her result: 2nd overall in Girls Under 19 class. Moroz performed solidly the first three days of the event, leading the Girls competition. Her goal was to stay as consistent as possible and win every heat but the format posed some challenges, as she explained. 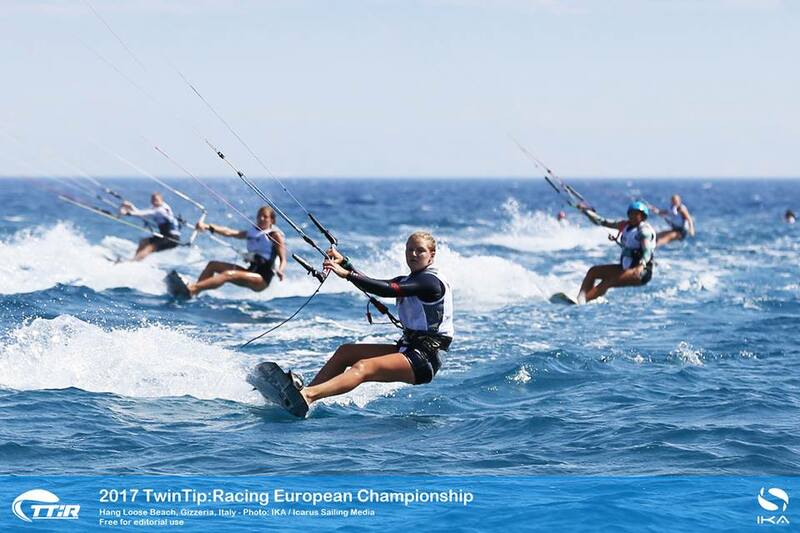 On the race course, twin tip racing is done slalom style, while foiling is regular course racing, like sailing. Moroz has a few thoughts about foiling versus riding twin tips acknowledging that transitioning from a twin tip to a foil is extremely challenging. But, she says, going from a foil to a twin tip just feels like going backwards…given there is much less speed and maneuverability involved. Kiteboarding has been accepted into the 2020 Tokyo Olympics as a demonstration/exhibition event and the discipline will be kite foiling, much to Moroz’ delight, with the format and equipment (kind of foils/kites) yet to be confirmed. Meanwhile, Moroz plans to continue TT racing with an eye on the 2018 Youth Olympics; the qualifying event for North America will be in January. Traveling the world and competing at high profile events has plenty of perks including the opportunity to check out world class kiting spots most kiters only get to dream about. 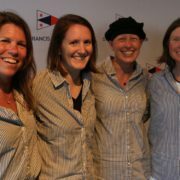 Through an initiative by the US Sailing Match Racing to promote match racing among women, the San Francisco Bay Women’s Match Race Clinic and Grade 5 Regatta on July 7 to 9 attracted 36 female sailors from the Bay Area, Southern California, the East Coast, and even St. Petersburg, Russia. The St Francis Foundation provided a grant for the event; in addition, ten J/22s owned by the Foundation and operated by the St Francis Yacht Club were used in the clinic. Foundation recipient Nicole Breault ran the clinic and was assisted by another Foundation recipient, Molly Carapiet. Erika Heineken has the distinctive honor of holding two World Champion Formula Kiteboarding Championship titles, two North American Championship titles as well as four Canadian National Championship titles. Heineken, 30, grew up in Larkspur and attended high school at Marin Academy, and she and younger brother Johnny are fixtures in the local sailing and kiteboarding scene. An engineer with the City of San Francisco Department of Public Works, Heineken lives in Corte Madera with husband John Tilney, their new baby Cody Heineken Tilney, and chocolate lab Belle. 1. Where did you develop a passion for water sports? My dad started windsurfing in the late 1970s and when my brother and I got to the age where we could learn to windsurf he immediately threw us on a board. Dad has also been a long time member of the St. Francis Yacht Club so we got on the water when we were very young. There are photos of me sailing on my parents’ boat in the Delta when I was a month old. Johnny and I learned to sail dinghies in the Richmond Yacht Club Junior Sailing Program when we were very young. I also coached sailing at the San Francisco Yacht Club for many years, and was on the University of Vermont sailing team. 2. How did you get into kiteboarding? Once Johnny converted over to kiting, I saw how much progress he made in a short time and was convinced I had to switch as well. I learned on a trip to Costa Rica one winter when I was in college — what started as a surf trip turned into a kiting trip. I ended up changing my ticket to stay for a month to learn to kite and became pretty competent. I returned home, bought kites and the rest is history. 3. Do you think other sports you played helped you develop as a kiter? I have played volleyball really competitively since fourth grade and through two years of college at the D3 level. I don’t know how much transferred over to kiting but definitely the competitive spirit did. I am quite competitive when it comes to the top level! 4. What have been your biggest accomplishments in kiteboarding? I won the World Championships (2012 in Cagliari, Italy, and 2013 in Boao, China), on the Formula Race Board, and I won a tour on the hydrofoil at a time when that form of kiting was very new. 5. What was the most well-earned award? The first World Championship I won was in Sardinia, Italy, in 2012. It had just been announced that kiting would replace windsurfing in the Olympics so not only was there way more attention all of a sudden internationally at this regatta but it was also the year Johnny and I won the world titles together. 6. How often do you get to hang out with brother Johnny? We see each other more in the summer when it’s kiting season, and during the winter we try to make time to take our dogs, brown labs who are sisters, for hikes and throw a Frisbee for them. 7. How do you stay in shape and specifically for kiting? When I’m sailing I try to exercise outside — hike, bike and kite. I’m at the top of my game in the summer when I’m kiting as I’m getting all the exercise I need. We sometimes ride our bikes home from work in the city and I love that. In the winter I try to squeak by with just sailing on weekends and going to the gym but that’s more for my mental health. 8. How do you juggle a career while competing as an elite athlete? It’s not easy. For about four years I was very focused on kiting and used all of my free time to compete internationally. Now I’m re-evaluating that decision after not kiting for the past nine months and considering how intensely I want to go back. Luckily my work has been flexible enough to allow me to take extra time off. 9. What is your philosophy now that you have a baby; will you stay active in the sport? We’re not going to try to change our lives too much. Cody will be in tow with us wherever we go (laughs)! Whether he likes it, we’ll have to wait to find out. He’ll go to daycare when I go back to work but on the way home, the beach is between work and home and his grandparents are just down the street so luckily we have a lot of help so I think we’ll still manage to get back into our kiting routine a few days a week. 10. What’s your advice and encouragement for women wanting to learn how to kite? Being comfortable in the water is No. 1 and skills from other board sports will really accelerate the process but isn’t required. It also pays to learn to fly a small trainer kite before taking a lesson. The 2017 St. Francis Sailing Foundation will be on March 21, 2017 at 4pm at the St. Francis Yacht Club. For more details, see here.